I am addicted to Twitter. Really, truly, I am. A year ago I would have never predicted that I would write a blog post about this most poetic form of social media. I first stuck my toe into the Twitterverse in an effort to help my husband figure it all out since someone at his work was suggesting that Twitter was the up-and-coming way to network. Ironically, or maybe not so ironically, I haven't encountered many other folks from my husband's workplace in my twitter encounters. But I have certainly found myself knee-deep in a most extraordinary virtual world that has captured my attention in many fabulous ways and that is transforming, yes that's what I said, transforming my life in a very multi-dimensional way. Don't believe me? Then read on. Here is my list of reasons for why I think Twitter is not just for the birds. And to help any non-initiated readers get a taste of what tweets are like, I've written this list a-la-Twitter. Tweet 1: The Twitterverse can be a very optimistic and encouraging place to be. Since I have been relatively selective in who I follow and take the time to "unfollow" anyone that is tweeting anything offensive, negative, or rude, I find that just about any time I drop in, I find myself smiling and humming a happy tune. Tweet 2: Most tweeps (twitterers) in Twitterland follow the same rules of etiquette that is taught in kindergarten. The golden rule, saying thank you all of the time, respecting one another's privacy...although it seems like these should be a given, out in the real world we all have experienced a lack of decorum here and there, or maybe even the majority of the time. Bit in Twitterland I have been shocked, amazed, and touched by the incredible politeness that pervades its users. This reinstills in me every day the joy that comes from being a good, decent human being. Tweet 3: There is a lot of humor to be found in Twitterland. Perhaps it takes a sense of humor to be willing to try Twitter in the first place. That's partly how I got started. I was actually determined to prove that Twitter was ridiculous and found it quite amusing to try and succeed in that vein. Alas, the joke was on me, I guess, and now I'm along for the ride each and every day. Tweet 4: There is something powerful about the support one can get in Twitterland. Possibly because most of the people I follow and that follow me are people I have never met in person and that have no real obligation towards me, I am constantly awestruck by the support that I get on Twitter. If I have a problem, I go to Twitter. If I am discouraged, I go to Twitter. If I need advice...you get the picture. And even if I ask a crazy question, I usually get an answer...almost instantly. I find it mind boggling that people I don't really know care about what I'm doing and who I am, whether it's the cellist-me that's tweeting, the pianist-me, the mommy musician-me, the wife-me...there's support there for every facet of me. Tweet 5: My tweeps give me a constant stream of videos to watch, sound files to listen to, people to pay attention to. Tweet 6: Twitter gives me instant access to many interesting musicians of all levels and all ages. I regularly tweet with many pianists that have performing careers around the world and the discussions that we sometimes have are fascinating. It is also fun to tweet with them about everyday things, some of which have nothing to do with music. Twitter makes everyone more normal, more real somehow and I find that so refreshing. And there are some musicians that are currently in music school that for some reason or another, enjoy tweeting with me. Even though most of them know I'm not a concert pianist travelling all over the world, performing with the cream of the crop, I think they enjoy interacting with me and sometimes even asking for advice on fingerings or repertoire. It's a bit surreal but I'll take it! And recently there was an interesting day that was called "Ask a Conductor" day in which conductors of orchestras both big and small, asked questions of one another and other non-conductor types asked the conductors questions. It lasted, I think, all day and was quite interesting to observe. Tweet 7: Twitter gives me an instant, global view of what is happening in the music world. We live in a small town where not a whole lot happens that rocks the classical music world. B.T. (Before Twitter) I used to dream up ideas of things I could do to help increase the classical music fan club and I often wondered if someone else was already doing those things elsewhere. At the time, there really wasn't an easy way to find out that out. A.T. (After Twitter) I can now find out what's going on all over the world. I follow the New York Times Arts Department, for example, so I read fascinating reviews and articles there. And during this past summer, I experienced the Proms in London for the first time. I didn't even know what the Proms were, at least not the UK version of proms. It lead me into a fascinating discussion between a follower in Canada and another in the UK about how differently different countries and governments view the arts. It was eye-opening, inspiring, and frustrating all at the same time. But that was good, very good. Tweet 8: Because I follow folks with whom I share many interests and views, I am constantly receiving links to articles that more often than not, strike a chord with me. Similar to Tweet 4, my education is further fueled by the many interesting links to blog posts, journal articles, and webpages. It's amazing to me how many tweeps I follow also write incredible blogs. But perhaps it really isn't that amazing. After all, I'm finding that Twitter really can be a place for thinkers, doers, and dreamers and it's those types of people that also tend to write a lot. How wonderful! Again, it's instant information at my fingertips. It's like opening the world up with each tweet being read. OK, I admit, not every tweet is educational. That's true. But you would be surprised, I think, about how much of it is. Tweet 9: Twitter enables me to have conversations with like-minded (or not like-minded) individuals that I don't feel I could have by walking down the street here in small-town USA. Through Twitter I have partnered up with a pianist in the UK, (you can follow Yukie (@yukiest) and I at @MusicalPinC, an abbreviation for Musical Partners in Crime) putting together recordings of piano duets that we've each recorded on our own side of the pond and merged to create one recording. I have discovered a wonderful young composer (@DanielBarkley) over in Northern Ireland and I'm currently learning one of his solo piano pieces, and hopefully another soon. A possible recording and collaboration is in the works with clarinetist Marion Harrington (@MazzaClarinet), who currently lives in Spain. I have connected and worked with Greg Sandow (@GSandow), a critic, composer, journalist, and writer that is currently working on a book about the future of classical music. Seeing him work and think has been an education and a wonderful experience. There are many other fun things in the works thanks to Twitter that I could never have dreamed up myself! So there you have it...my tweets about tweets. I'm sorry I didn't confine myself to 140 characters for this blog post. I guess you'll just have to meet me on Twitter to see the more succinct-me :-) Go on...you know you want to. Just click on this cute little birdie button to get started. It won't hurt. Promise. Are those double-flats I see all over the place?! Octaves and double-flats at the same time?! I hope this is slow...oh wait...it says "eilig" and "heftig" what does that mean? Oh great, it means "urgent" and "driving." Now what? Well, as with most new music that I get, I decided to stop panicking and to practice what I preach which is to look before I play, to figure it all out before falling into the trap of random, unorganized, slightly or fully desperate music cramming. Here's how I went about learning the music. Working backwards (I always work backwards), I started with the final 3 measures, asking myself, "What do I see?" The second-to-last measure is a 3-note pattern, starting on the second eighth note, on D-flat. Each statement is one octave higher and the hands alternate, left-right-left. Last two chords are made up of the same notes (a B-flat minor chord) but in different inversions & in different hands. First chord is sforzando and the last one triple piano. Leading up to the 3-note pattern are repeated Fs that start right after the second beat and that diminuendo. After making these observations, I slowly played each hand separately, at a tempo that enabled me to consciously think through everything I had figured out about the music. Then I put the hands together and played slowly, in the same engaged way. After a few times, it was learned and practically memorized. The left hand and the top voice in the right hand stay the same for the entire first measure. The line that moves, the bottom voice in the right hand, moves down the chromatic scale. At the beginning of the second measure, the right hand is still moving down in half-steps but both voices move this time. This isn't so bad...yet. Onward! Or rather, backward ho! For this entire 3 bars, the hands are playing in octaves...piece of cake! Almost entirely chromatic movement being the sneaky little whole step at the end of the second measure...looks like it's going to be a third of some sort but it's not. Since enharmonic writing can play tricks on me, I chose to write in the A-natural again. Even taking the time to think this out and write it down can eliminate any confusion later on. Whenever there are two repeated octaves at the beginning of a set of three eighths in the right hand, the left hand leaves out the second of the two eighths, adding an additional rhythmic element into the mix. I think this helps to propel the music forward. Not surprisingly, once the chromatic material starts going up, the music is accompanied by a molto crescendo. These two measure are made up of E-flats, F-flats, F-naturals, and G-flats. It starts with the F-flat octave in the left hand, played piano. Right hand loudly interrupts at the tail end of the second beat, playing an accented half-note motive that immediately repeats an octave below, in both hands. Sudden pianissimo follows while both hands remain on F-flat octaves which are repeated until the last eighth note when it goes up chromatically again, with a small crescendo, surprise, surprise! Entire pattern of the first measure is repeated, but starting this time on G-flat. Aack! Double-flats! OK, breathe...figure it out. Are they scales? The first scale in the right hand is actually a G-flat minor scale with a chromatic note thrown in at the beginning of the third beat. The scale in the right hand in the second measure is a F-flat major scale with the chromatic thrown in on the last eighth note of the second beat. Or since I have that aversion to double-flats, I prefer to think of it as an E major scale. Ah, E major. Not quite sure of a neat and tidy way to explain the left hand although it is pretty straightforward harmonically - no big surprises. Musically the dynamics make sense again (thanks, Wolf!) with crescendos occurring each measure to accompany the upward-rising scales. Right hand moves chromatically again until the last eighth note of the measure which moves up by a whole step (darned double-flats again!) There is a crescendo on these final rising notes. Left hand has a bit of its own pattern going on for the first two beats but the beginning of each beat is a tenth away from the right hand octaves. The subito piano on the second eighth note helps to point that pattern out, at least in my mind. This time the left hand moves upward chromatically, starting on the second eighth note of the measure and ending at the end of the measure. The gesture is accompanied yet again by a crescendo. The right hand uses a repeated dotted-rhythm motive throughout the measure, adding a note in the final two notes of the measure to help lead to the downbeat of the next measure. In the second measure, both hands have the same dotted rhythm. Same notes are repeated throughout with some accented chords in the right hand as the main exception. The first measure looks especially familiar...hmmm...It's exactly the same as the first measure of the previous chunk. Chromatic scale in the left hand, starting on F and starting right on the first eighth note. Again, this is accompanied by a crescendo and by dotted-rhythm octaves in the right hand. An additional note is again thrown in to the octaves on the last beat of the first measure. Subito pianissimo at the beginning of second measure highlights change in texture and rhythm. Very basic, simple harmonic structure in this measure. This measure is basically the same as the second measure of the previous chunk, with the right hand in a different inversion, that's all. I'm loving the right hand. The same thing throughout the first four measures. I notice what the pattern is and then play it with the right hand alone until I no longer have to think about it. It's auto-pilot time when it comes to repetitive figures. In the left hand, the first two measures are identical, starting with mezzo-fortes on the second beat. The third and fourth measure in the left hand are octaves in the third measure and than one compact crunchy chord in the fourth measure, on the second beat. Ta-da...Wolf's piece is much more understandable to me. The notes aren't random anymore and now when I practice, I feel like I'm speaking the composer's language because I've taken the time to study it. I think it's also important to point out that my analysis is not full of profound theory analysis. There's no Schenker here, no talk of Roman numerals or anything of that nature, largely because I am not very good with that stuff. I think anyone can become a music detective, making basic observations such as the ones I've made here, to make sense of the black dots on a page. So next time you need to learn a piece of music, try picking up a musical magnifying glass to see what you can find in the music to make some sense of it. Just as all those crime investigation shows on TV can be addictive, so can musical sleuthing. And now I close this post with a famous Sherlock Holmes quote, "You know my methods, Watson." Now run with those methods and have fun! But there is one benefit not listed above that I love almost more than any other and that is the opportunity it gives a pianist to be a sponge. Yep, that's right, a sponge. Most piano collaborators spend a high percentage of their time in the studios of music teachers and professors. Some lessons might be more interesting than others, but for the most part I think it's safe to say that if a pianist wants to, he or she can soak up a tremendous amount of information every time the situation involves a coach, teacher, or conductor. I've learned a lot of really interesting things in such situations, from the basic mechanics of playing many different instruments to musical concepts. Sometimes I even have somewhat of an out-of-body experience where I actually begin to feel like I could play the other instrument or sing if I wanted to. If you catch me at the right moment after a voice lesson, you may even hear me vocalizing and trust me, I am not a singer! I don't even sing in the shower for fear of embarrassing myself. (It probably doesn't help that I'm married to an excellent singer!) But I almost can't help myself. The experience of hearing all this fascinating information, which sometimes feels top-secret, of seeing and hearing immediate results, is exhilarating and slightly addictive. I've recently had one of these out-of-body, spongelike experiences. These past few weeks have been filled with rehearsals and lessons in preparation for the local college students' juries. Every year I seem to end up with a different mix of instrumentalists and singers. This year I ended up playing for what seemed like an endless stream of flutists. Now I happen to have a soft spot for the flute because I have loved listening to it all of my life; I even purchased a flute back when I was in high school and then again after I was married because I was so enamored with the flute sound. This is a completely private experience for me...nobody gets to hear me play except for my tiny family and lovebird and trust me, there will probably never be any videos of me on YouTube. But after sitting in lesson after lesson recently and after doing some very good impersonations of a sponge, I went home one day really feeling like I would be able to pull my flute out and actually be able to sound like something. I doubt there was any grand transformation when I did, but I do believe that I was able to apply much of what I had learned in those lessons to my own experience of playing the flute. And that was fun. It also added inestimable value to the job that I already get a lot of value from. Can't ask for much more than that! 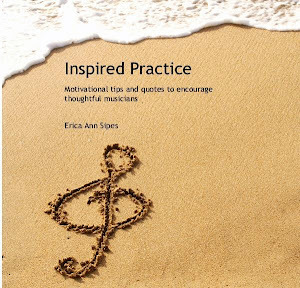 So piano collaborators, next time you're sitting in a lesson feeling a little bored, a little invisible, make like a sponge and start soaking up as much information as you possibly can. You never know where it might take you! Wait, can sponges even move?! Well, whatever. I think you get my point! Perhaps it's because I am a big fan of the Harry Potter series and because I recently saw the latest installment in the movie theater - I simply can't get the vision of sinuous, slithering snakes out of my mind when it comes to Bach's 8th Prelude and Fugue, in D sharp minor. It probably doesn't help that having to play in this key (6 sharps!) forces the pianist to maneuver in and out of the black keys with a feeling much similar to that of this most-beloved creature. It also doesn't help that the challenge of playing in this key tends to cause my mind to twist and turn and to pull tighter and tighter in upon itself as some snakes do in order to catch their next meal. Sounds a little dramatic, you say? Perhaps, but all I can say is that I can usually only take these pieces in small doses, especially the Prelude. And in case you haven't figured it out, I'm not a big fan of snakes. But no worries. I may not like snakes and I may not have warm fuzzy feelings for this prelude and fugue set but Bach being Bach, I still find great beauty in this music. The Prelude is a wonderful example of the composer's ease at speaking in counterpoint, with its invention-like feel, 2 voices imitating one another and intertwining in a mathematical but intimate way. It's sort of like the photo of these two snakes. Yes they are snakes, but together, intertwined, they create a moment of great beauty. It speaks to me of the simple joys found in companionship. And the Fugue...this time not just two snakes but rather four, creating an even more intricate fusion of life. 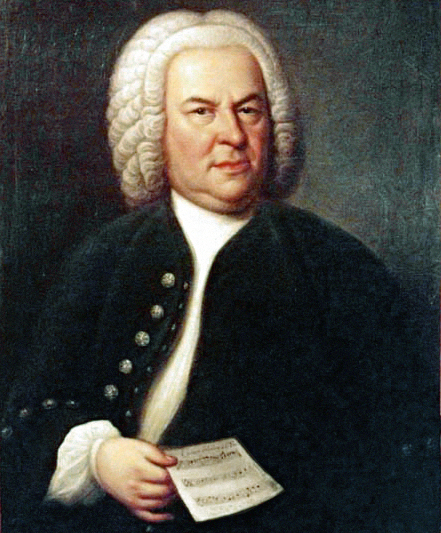 And to top it all off, Bach places two voices, the soprano and the tenor, in a mirror image of one another as the final statement of this wonderful fugue. I can't help but think of the image that is used to represent the medical profession - two snakes wrapping themselves around a staff. What a wonderful, tidy way to put our snakes to rest. When I think about Bach's music, I rarely think to describe it as playful. Perhaps it's from looking at those serious portraits of the composer like the one here. Or maybe it's because his music can be unbelievably challenging, especially his finger-twisting fugues - the last thing I think of doing while playing a particularly nasty one is smiling. But I do believe Bach was fully capable of being playful, and spirited, and ebullient. He was, after all, a father to 20 children. 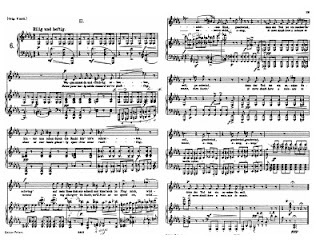 I imagine there was quite a lot of laughter to be found in his home, and I also am guessing, thanks to this E-flat major Prelude, that there was also plenty of teasing, taunting, and childish terrorizing that went on. Every time I hear or play this particular prelude, I can't help but think of a little teasing game my own family plays from time to time. In our household, we are very, very good at being serious, perhaps too serious. We are also good at being dramatic, usually choosing to air on the side of being melodramatic, of course. Well, when one of us notices what's happening, that we're all being swept down the river of pessimism and grumbles, he or she will say, "OK, that's it. Today is a very, very serious day. Nobody laugh. Nobody smile. Wait...what's that I see? Do I see the corners of your mouth starting to turn up?" We continue in this vain until we all burst out laughing or smiling. It never fails. I think Bach and his family could have shared the same strategy. The prelude starts off happy enough but after a few lines, it seems to make a turn toward the more serious. This is where the play begins. He starts by alternating short, descending, laughing motives in the right hand - "Now don't laugh." This is followed up with a more serious, ascending, whining motive - "You must be serious." . After a couple of these exchanges, Bach starts into a hilarious sequence of material that repeats numerous times with what sounds like hiccuping, or laughing, or teasing in the left hand. 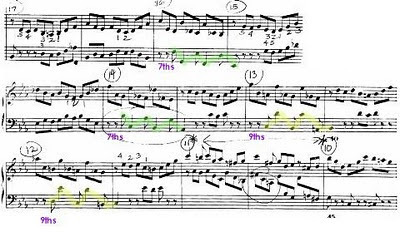 At first the intervals he uses are sevenths but then in the last four measures of the sequence, the left hand plays 9ths - a very wide and odd interval, especially to be repeated over and over again, and especially in a piece by Bach. If he had simply bumped the second notes of the two-note hiccups up an octave, these motives would have sounded perfectly normal. If Bach could join in my family's little jibing session, I think he would have used this to break us down, sending us into fits of giggles. It works for me. What follows is one last struggle to keep drama in the picture which quickly fails and leaves me in a much lighter mood for the rest of the piece. 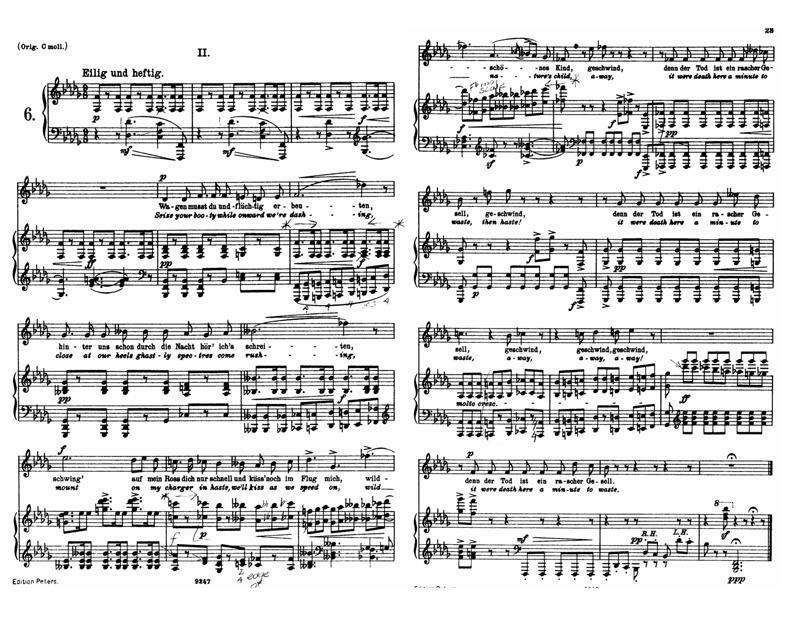 The E-flat major fugue, for me, is the contentedness that follows after such a silly family moment. With a renewed, more optimistic perspective on life again, the fugue is almost entirely free of drama or angst. And with surprisingly few subject entries, there is a lot of room for musical strolling, with no concern for the expectations or protocol expected with a fugue. But Bach doesn't forget playfulness all-together in this fugue. There are a handful of subjects in which the rhythm at the beginning is altered just slightly, changing the first note from a whole note to a half-note and transforming that one note into an upbeat.